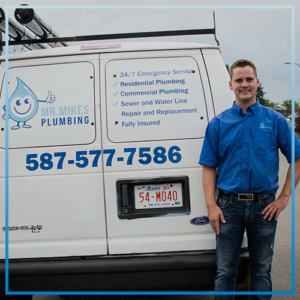 Mr. Mike's Plumbing is not like other Calgary Plumbing companies, our passionate and skilled owner Mike Brock started Mr. Mike's Plumbing in 2014 after working many years in Alberta & Calgary area. He saw a need within our community for a plumbing company that cares about the customers. A company that won’t make you wait on hold on the phone or make you wait around all day hoping the technician will arrive soon. Mr. Mike’s Plumbing has skilled and friendly technicians that are there to make you feel comfortable and taken care of with an owner that is only a phone call away. With us you know your plumber’s name, the phone is always answered by a friendly voice, your business is actually appreciated, and you will be given respect, reliable service and a fair rate every time. Mike's vision proved to be just what the people of Calgary were waiting for and in only one short year he went from a sole tradesman to a team of 2. Now the company has grown a company with 7 certified technicians, and 3 office staff that has expanded to serve of all Calgary, Airdrie, Chestermere, Strathmore, Cochrane and Okotoks that run 24/7 to serve you best. With our company you can rest assured knowing that Mr. Mike Plumbing employs more licensed plumbers than apprentices and an owner that cares and is involved in all daily operations. With Mr. Mike's Plumbing team of reliable and experienced plumbers we can offer you a full range of plumbing services including all aspects of plumbing, drainage, hot water and renovation. We service all Calgary areas from Arbour Lake to the Shawnessy. Put us to the test and experience what being a customer should be – great service, exceptional standards and knowledgeable trades people. We pride ourselves on being the one plumbing company that you will want to use again and again and recommend to your family and friends! If your not sure if Mr. Mike's Plumbing can help you, just give us a call, our friendly and experienced staff will be happy to help! Mr. Mike's Plumbing is one of the most reputable and dependable plumbing emergency repair service contractors in the Calgary/ Alberta area. We service all areas throughout Calgary City so there is no need to look elsewhere when you need prompt, professional, and reliable plumbing and drain service. We also utilize the latest technology from digital camera systems for drain lines to thermal imaging to deliver the best service to all our customers. A Calgary professional licensed plumber can perform regular service inspections. But of course, when the unexpected happens in Calgary, emergency 24-hour plumbing service is required. Mr, Mike’s Plumbing is there for you 24 hours a day, 7 days a week with a staff always on call. You can trust your plumbing needs to a licensed and insured plumbing contractor with years of experience; and reliability second to none in the Calgary area. A plumbing repair needs will be addressed by a professional licensed plumber who can get the job done quickly and correctly the first time. After time, grime can slowly build up in your drains and when this happens the plumbing throughout your home can become slow and eventually clogged. There are many reasons to hire your a Calgary plumber to address your slow drains in Calgary. The most important is that you can do is hire for our drain cleaning service can clear the slowed lines before they cause any larger problems such as floods and corrosion on certain types of plumbing. We want you to avoid unnecessary repairs and insurance claims. We can also do the drain cleaning job quickly and in the most eco friendly ways. Many times there are corrosive and damaging liquids built up in the systems that require a certified plumber. All homeowners and property managers will eventually be bothered by home maintenance issues. One of the biggest problems that can test the patience of people in this regard is not being able to find the right person for the required home maintenance job. There are many areas that you need to properly take care of in your home such as your electricity, wiring, and plumbing. Plumbing maintenance is not an easy thing to do, which is why finding an expert and reliable plumber is quite a task. The plumbers at Mr. Mike’s Plumbing Calgary will make your home maintenance repairs easy and cost effective. There can be several plumbing issues ranging from clogged drains, to repairing and replacing water heaters, sump pump maintenance, and replacing leaking toilets, among others. Take the guesswork out of trying to do your repairs yourself and call Mr. Mike’s Plumbing Calgary to have peace of mind that it’s done right the first time. Plumbing is not an area that should not be ignored, because a little issue can end up in quite a disaster in the longer run if it’s not handled properly and timely. What if a naked wire is exposed to water pooled down due to a pipe leakage in your bathroom. This can surely lead to short circuiting and burning down of your house (partially or completely). To avoid such situations, being able to access a best plumber in Airdrie in the shortest possible time is the best way out. Managing your own repairs can be a good solution to simple repairs, but certainly not advisable when security of your house is on stake.